Smit tackles this universal human experience with intelligence, sympathy, and wit. An accessible book, Loves Me, Loves Me Not will be an invaluable tool for youth pastors; singles group leaders; college students; and students of human sexuality, marriage and family, and Christian ethics. 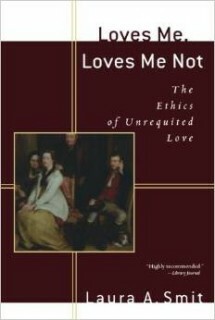 “Smit has crafted an insightful, meticulously researched treatise on the ethics of unrequited love as it pertains to practicing Christians today. Topics such as how to reject someone confidently but gracefully and whether or not non-mutual love has spiritual value will offer much needed guidance to those for whom traditional church rhetoric about sexual behavior misses the point. . . . In a refreshing break with mainstream ideology, Smit urges readers to rethink societal expectations about marriage, and champions singlehood as a valid and spiritually fulfilling life choice. . . . In addition to compiling hundreds of pertinent clips from popular music, film, and television, Smit interviewed more than one hundred students and alumni of all ages. These heartfelt, real-life stories, combined with the author’s impressive knowledge of Scripture, make for a remarkable reading experience that is nothing if not divine.”–Aimee Sabo, ForeWord. Read the entire review here. “For those who do not intend to marry, [this book] will offer a theological texture to their lives. For those who are dating, it offers a practical guide and a great deal of wisdom. For those who are married, it will put a stop to asking annoying questions like, ‘Are you dating anyone?’ I know of no other book that combines substantive theology with practical advice on dating and a whole host of personal experiences … “ — David M. McCarthy, Reviews in Religion and Theology.